STEPHANIE ST. CLAIR: The French-African immigrant ran a numbers bank in Harlem in the 1920s. By the 1930s St. Clair, known as "Queenie," became so successful that she was squaring off against Dutch Schultz over the territory, with Schultz demanding she pay a "protection fee." She resisted paying, which angered the mob and made her a marked woman. Eventually, with the help of her protegee/future mob figure Ellsworth "Bumpy" Johnson, she brokered peace with Schultz and agreed to pay a "Mafia tax." However, when Schultz was assassinated, St. Clair sent a telegram to his hospital bed, "As ye sow, so shall ye reap," signed, "Madame Queen." 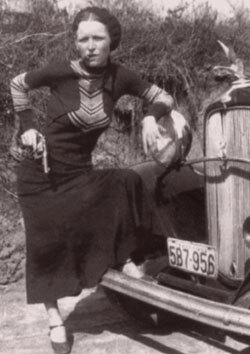 BONNIE PARKER: Romanticized in the 1967 film, Bonnie Parker and her boyfriend Clyde Barrow were the focus of one of the most spectacular manhunts the country had seen. Between 1932 and 1934, the couple and their gang robbed gas stations and stores—and also kidnapped and killed civilians and lawmen alike. Parker became famous when a photograph of her smoking a cigar was found at one of their hideouts. The picture was published in newspapers, and made her a celebrity. But on May 23, 1934, the law caught up to them near Sailes, Louisiana. Police officers from Louisiana and Texas waited in bushes and when Parker and Barrow got in their car and were trying to drive away, the officers opened fire, killing them instantly. ARLYNE BRICKMAN: Born to a Jewish auto dealer/racketeer in 1933, Brickman threw herself into the world of New York's Italian Mafia, having romances with various low-level gangsters and eagerly helping them run drugs. Brickman, who moved into loansharking and bookmaking herself, was raped in the basement of a mob hangout. Her gangster friends refused to avenge her. This stunning photo of San Francisco quite literally throwing shade comes to us via photographer Arthur Chang.